In 2017, Stefan Schwander has returned to the limelight with his Harmonious Thelonious project, when new releases have appeared on Kontra-Musik, Versatile and most recently on The Trilogy Tapes. “Ayranman EP” was published already in the summer and it marks the artist’s return to the Düsseldorf label Disk, formerly known as Diskant. For Schwander, who has worked under Antonelli Electr. and Rhythm Maker monikers, it’s home turf because Diskant was set up by him and two artist friends, Marc Matter and Florian Meyer, who all together are performing as The Durian Brothers. 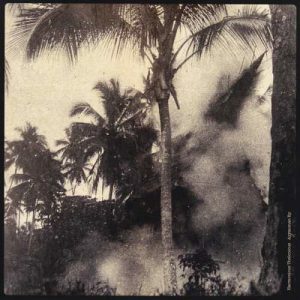 Subtropical rhythmic noise has been the label’s signature sound and as expected, “Ayranman” remains centred on rhythms. Still an interesting blend comes up already in the opener “Sketches”, where Far Eastern strings are meeting Saharan caravan soundtrack. The standout tune is “Manta Mantra”, a true brain invader where synth sinusoids are ascending to higher spheres and dubbed out textures remind of finest pieces in the SD Records catalogue. The title track is a mix of bone-dry drums and modular sequences while soft-spoken “I Found A New Way Of Loving You” is out for a warrior romance. Again a highly enjoyable record from Harmonious Thelonious.